The source protection plan is a series of policies developed in consultation with the local community to protect municipal drinking water sources. The policies apply within Intake Protection Zones where significant drinking water threats may occur. More information on the delineation of the Intake Protection Zones (IPZs) and the analysis of drinking water threats within the IPZs is found in the Assessment Report (click here to go to Assessment Report). Source Protection Plan (SPP) policies range from softer approaches (such as encouraging best management practices by way of a public education program) to more regulatory style approaches (such as requiring risk management plans), and in specific cases, particular activities may be prohibited within the Intake Protection Zone. The Proposed Source Protection Plan was submitted to the Ontario Ministry of the Environment (MOE) in October 2013. After a full review of the document, the MOE approved the Niagara Peninsula Source Protection Plan on December 17, 2013. Please follow the links below to view the approved plan along with the Schedules (figures) and appendices. What are the objectives of the Source Protection Plan? To protect existing and future drinking water sources in the source protection area. If the activity is occurring when the source protection plan takes effect, the activity ceases to be a significant drinking water threat. What is the Explanatory Document? The Explanatory Document accompanies the Source Protection Plan and describes the policy development process and the rationale behind each of the policies. It should be read in conjunction with the Source Protection Plan. Source Protection Plans must contain policies to address the significant drinking water threats that are identified in the Assessment Report. In the Niagara Peninsula Source Protection Area, activities that are considered significant drinking water threats only occur in the vulnerable areas around municipal water treatment plant intakes. These vulnerable areas are known as Intake Protection Zones (IPZs). Three types of IPZs were delineated: IPZ-1, IPZ-2, and IPZ 3. The Assessment Report provides details on how each of these types of IPZs was mapped. The table below shows all the IPZs in the Niagara Peninsula Source Protection Area and which IPZs contain significant threat policies. * Policies in the IPZ only apply to threats identified by event-based modeling and may not apply to the whole IPZ. Do SPP Policies Apply to the IPZ? The figure below shows the IPZs where major threat policies apply. The Source Protection Plan indicates the specific IPZs where each policy applies. 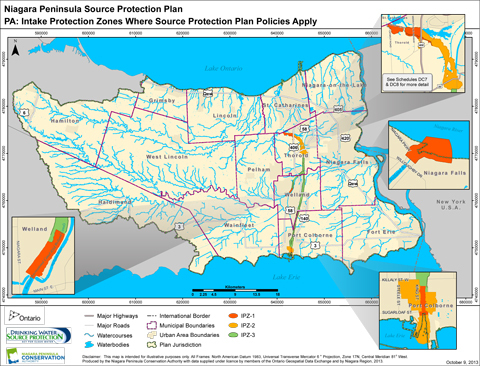 Since the Source Protection Plan policies only apply within these IPZs, and they only cover a very small portion of the Niagara Peninsula Source Protection Area, the vast majority of property owners in Niagara will not be subject to the policies in the Source Protection Plan. The Proposed Source Protection Plan and Explanatory Document were initially submitted to the Ontario Ministry of the Environment (MOE) in July 2012. Threats identified by event-based contaminant modeling. The SPC chose to conduct contaminant modeling of potential diesel spills along the Welland Canal and Welland Recreational Canal after a diesel spill on the Welland Canal caused a shut-down of the Port Colborne Water Treatment Plant for several hours in 2010. The event-based modeling confirmed that a large spill would have an adverse effect at the Water Treatment Plant intakes located along the Welland Canal. Consequently, the handling, storage, and transportation of diesel fuel should now be considered a significant threat. Some new policies were added to the SPP to address these newly identified significant threats. How were stakeholders and the public consulted on the initial Source Protection Plan that was submitted in 2012? In developing the SPP, one of the first tasks was to draft the policies to address the significant drinking water threats which were identified in the Assessment Report. Source protection staff and the Source Protection Committee (SPC) then “pre-consulted” with the organizations and people that would be directly affected by the policies. This included sending out notices, giving presentations to councils, and meeting with municipal staff and key stakeholders such as the St. Lawrence Seaway Management Corporation and landowners who may be directly affected. The draft policies were then revised by the SPC, after considering the comments that were received during this pre-consultation phase. A draft of the SPP was then prepared which incorporated the revised policies. An accompanying Explanatory Document was also prepared as required by legislation. Other agencies such as the Niagara Escarpment Commission, local Chambers of Commerce, and committees of adjacent Source Protection Areas. The Source Protection Committee (SPC) reviewed and considered all comments that were received from stakeholders and the public during the first public consultation period, and then made changes to the plan as it felt appropriate. The second round of public consultation was held on Friday, May 18, 2012, to Monday, June 18, 2012. The public was invited to read the Proposed Source Protection Plan (SPP) and accompanying Explanatory Document and provide comments on the proposed SPP by June 18, 2012. Notices were posted in local daily papers and sent out to all municipalities as well as those implementing bodies and directly affected landowners who submitted comments on the Draft Proposed SPP during the first public consultation that was held in March and April 2012. Comments that were received during the second round of public consultation (which was held from May 18 to June 18, 2012) were forwarded along with the Proposed Source Protection Plan and Explanatory Document to the Ontario Ministry of the Environment (MOE), since no changes were allowed to be made to the Proposed SPP during or after the second public consultation period. Municipalities and government agencies that were directly impacted by the 2013 updates to the Source Protection Plan (SPP) were contacted and advised of the proposed new policies. Source protection staff also met with municipalities and agencies to discuss the new policies if requested. The SPP and policies were then revised to address concerns that were raised during the pre-consultations. A public consultation was held from August 28, 2013, to September 27, 2013. The public was invited to read the Proposed Source Protection Plan (SPP) and accompanying Explanatory Document and provide comments on the proposed SPP. Notices were posted in local daily papers and sent out to those implementing bodies affected by the proposed changes. The Source Protection Committee (SPC) reviewed and considered all comments received and made changes to the plan as it thought appropriate. The SPP was submitted by the Source Protection Authority to the Ministry of the Environment (MOE) in October 2013. After reviewing the documents, the MOE approved the Source Protection Plan in December 2013. A notice of the approval of the plan was posted on the Environmental Registry shortly after that. The Ontario Minister of the Environment has indicated the Source Protection Plan will legally “take effect” on October 1, 2014. Over the next several month’s municipalities and other implementing bodies will be preparing for the changes that must occur once the plan ‘takes effect’. For instance, planning decisions must adhere to the policies in the Source Protection Plan starting on the date the plan ‘takes effect.’ Other implementing bodies will also be gearing up to implement the policies they are responsible for.